You must be thinking why would gamers replay invaded Stronghold Mission in The Division 2, but the answer lies in its latest update. If you have played the original Divisions, you must have remembered the Legendary missions which got introduced in its second year. There are reports doing the rounds that re-playing The Division 2 Endgame Invaded Mission is difficult but that’s not true. In this guide, we will teach you how to replay Invaded Mission in The Division. According to GamesRadar, In the Invaded Stronghold mission, the original foes have now been replaced by the fourth faction enemies, The Black Tusks, which are seriously nasty beings that fortify missions in many ways. However, Invaded missions are much quite interesting and cleverly designed than they suggest. The following is a method which you can use to replay the invaded mission in The Division 2. How to replay Invaded Stronghold Mission in The Division 2? If you are still wondering why would people bother to play it again. We bet you will replay the game once you read this guide till the end. Since it became a source of Nemesis Exotic gun parts and several new gear sets. First of all, you will have to open the map and select this week’s invaded stronghold mission. You have to press the button which opens up the difficult settings (G on PC). Make sure you don’t just hold it since it will do something other than what you desired. Once the difficult Menu is opened, you have to press the same button again to toggle invasion. If you want to make sure you’ve toggled the invasion on and not off, there are certain things you should look for. The map icon should be Red instead of Blue and make sure that the lowest difficulty setting will be normal, instead of a story. The highest will be heroic instead of not challenging. The rewards will change – you’ll get a lot more XP, and the boss names will change. Finally, the description of the mission will mention the Black Tusk. 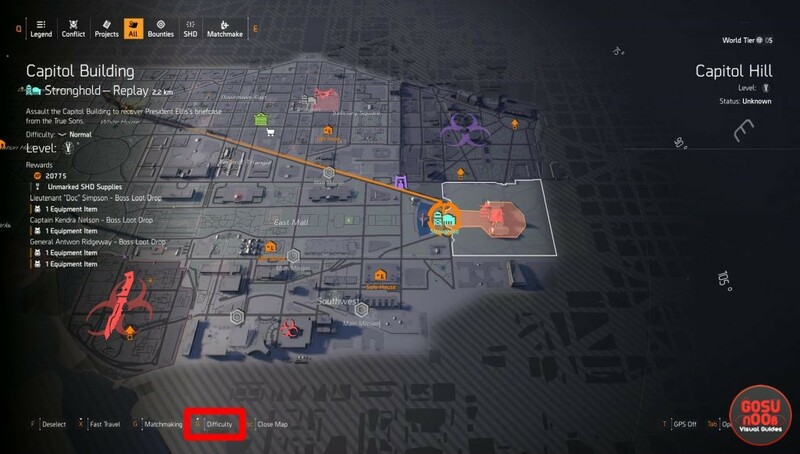 Notably, by using these guidelines you can play the mission as many times as you want even if you are not searching for the specific drops and offered inside. 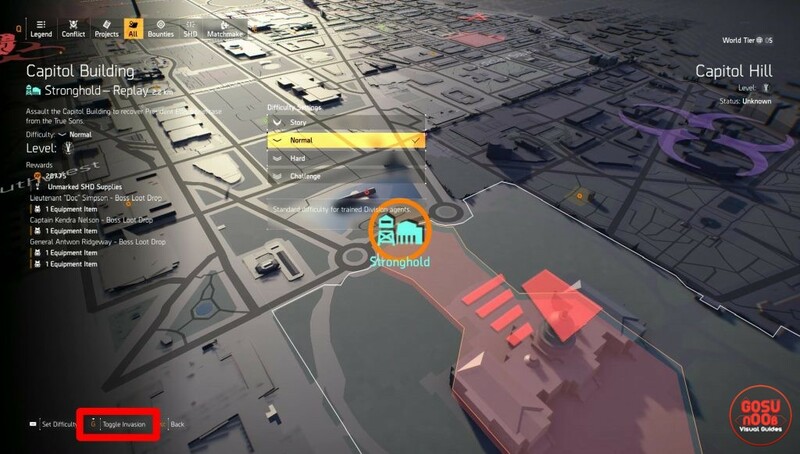 Now, you must have understood how to replay invaded stronghold mission, be sure to head back over to our other The Division 2 guides for more help.